The short answer is no. Pickles does not set the price – it is set by the vendor of the car, and we have not been given the authority to negotiate on the price. Usually the price is set at or below the market value, however some things can have an impact especially the number of kms, accessories included, or premium models. Is that the drive away price? The price doesn’t include stamp duty, transfer fee etc. Check with the branch for the final price. It will be mentioned in the description of the car in the details section. If you’d like to register a car, some of the branches can do it for you. Please check with the branch. Does it come with RWC? Certain vehicles come with a 5000km/3-month (whichever comes first) statutory warranty. Please ask the branch where you’re buying if it is applicable to your purchase. We also sell extended warranties, click here to learn more for components covered, fees and charges. For the manufacturer’s warranty, refer to their individual site for terms and conditions. We do not take responsibility or make any promises that the vehicle will meet all of their conditions. If I wait, will the car go to auction? This is not something we recommend, as it will more than likely sell. If a fixed price car doesn't sell, the vendor might run the car through the auction. If the top bid doesn't reach the reserve, the vendor might negotiate with the top bidder to see how close they will go to the reserve. That's really the only time the vendors will negotiate on price. No, Pickles do not own the vehicles, and our vendors do not allow us to let customers test drive the vehicles. Also Pickles is not insured to a sufficient level to cover your safety and that of other customers in a test-drive situation. When you see how many cars we have onsite, it will become obvious why this is not really possible. When can I view the car? Fixed Price cars are always available for viewing during branch hours. How do I know if the car is in good condition? 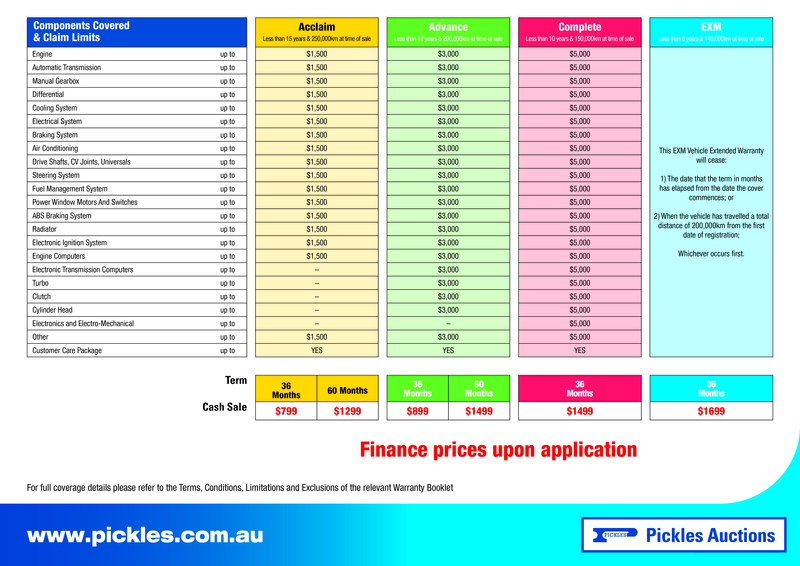 All Pickles vehicles have a detailed condition report, which is based on an external walk-around. It can be found by clicking on the link at the bottom of the details section. Why are there no photos of this car? If there are no photos showing, it suggests that we are still processing the car; perhaps it has only just become available. Photos should be up within a day or two. If they are not, please call the relevant branch. How can I be alerted when these cars become available? To be updated on any new stock of a specific make and model create a product alert here. How often does your stock turn over? We get new stock almost every day. Keep an eye on the website and sometimes if there is a car that matches your needs but it is coming up for auction, you can enquire at the branch whether the vendor will accept a fixed price before auction. Yes, we do. Learn more here. Do you transport the car interstate? We accept credit card, debit card, bank cheque, cash deposit. Refer to our admin fees here. After putting down a deposit, you get 24 hours to pay the balance. Once we receive the funds in our account, the car should be picked up within 2 days - after which, storage fees can apply.